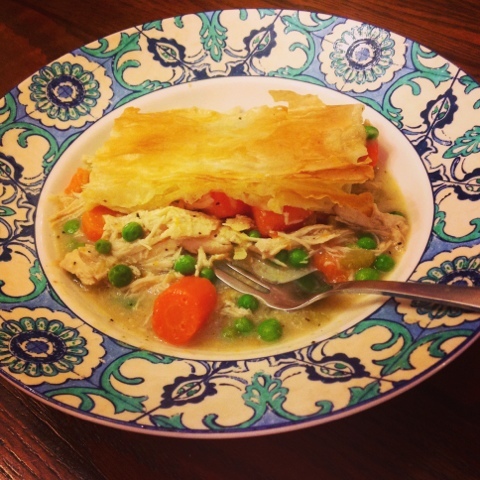 There's nothing more comforting than curling up on the couch on a chilly night with a warm bowlful of chicken pot pie! Until you realize you just consumed upwards of 750 calories & over 50% of your saturated fat for the day! Tonight we are heating things up with our hearty and healthy (not to mention guilt free!) Chicken Pot Pie Casserole. Our version skips the cream, the pie crust & the calories but when you are indulging in this delicious dinner, we promise you won't even miss it! We start by melting up one tbsp of butter and one tbsp of flour to create a creamy, delicious texture. We double up the veggies with a whole pound of carrots, celery and sweet peas for color! We add lean chicken breast and top the casserole with phyllo dough for the perfect buttery topping at a fraction of the calories. 1. In a deep sauté pan, melt butter and mix in flour until lightly browned. 2. To pan, add peeled & chopped carrots, chopped celery, chopped white onion and minced garlic. Sauté 10 minutes over medium heat. 3. Stir in chicken stock and bring to a light simmer. Add chicken and simmer until cooked through. Remove chicken, shred and add back to pan. 4. 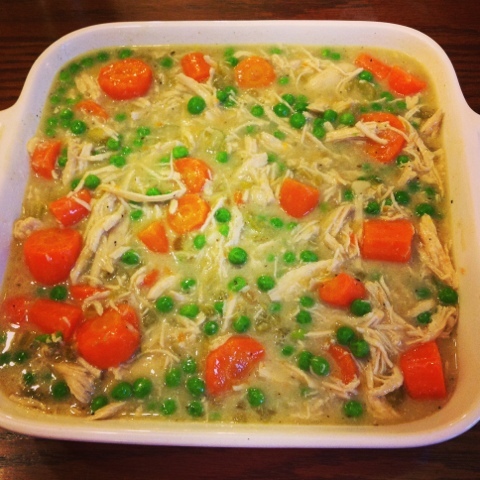 Stir in peas and add chicken pie filling to a baking dish. 5. Layer one sheet on phyllo dough on top of pie filling and brush with olive oil. Repeat with all 4 layers on dough. 6. Bake at 400 degrees for 15-20 minutes until top is brown and bubbly. 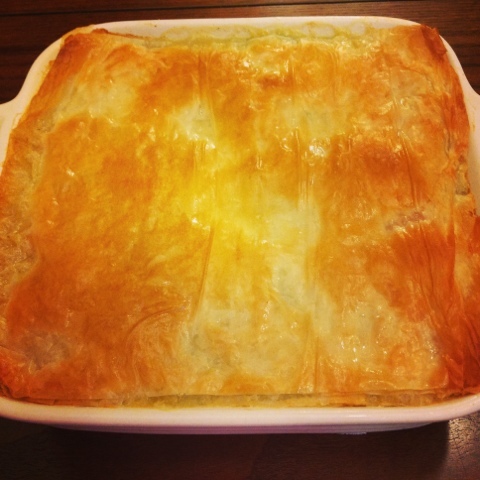 Do you ladies have the Nutritional chart for the chicken pot pie casserole? Sure! We are still adding calorie counts to some of our original recipes! Oh, boy, thanks heaps! I'm TotallyWiggedOut , a member on WebMD in the 50-100lb diet community. I've lost a bit over 70lbs by searching new sites for good recipes. We also share links to recipe sites that look good or we've tried and personally approved of. I'm here to tell you. Your site is GREAT! And this fast reply to my question will definitely bring me and my community friends to you time and again. I tried your Buffalo Turkey Meatballs tonight. YUMMMMM MEEE ! I will pass on this nutrition info since two other members peeked at your site and both fell in love with the idea of this pot pie.